Used widely as a hedging plant, Taxus baccata Fastigiata is the Irish Yew . With an upright habit or columnar growth habit it will reach around 3m in height with a 1m spread in around 10 years. Over time if left unpruned the plant will broaden in growth habit although still upright it will spread to 2m + near the crown. The Irish Yew, is popular because it takes so well to shaping and pruning. It differs from the English Yew mostly in terms of its upright habit. Slow growing but with very strong wood. A well drained humus rich soil and a position in full sun to part shade. Flat dark green leaves the male plants will produce cones while the female plants produce red berries which are poisonous. Propagation is generally from cuttings. 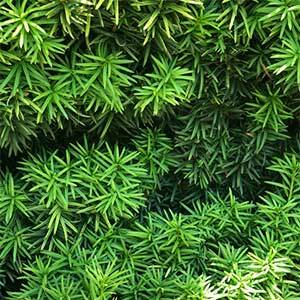 The most widely used in landscaping where the upright growth habit lends it to be used as a screening plant in narrow spaces. Can be grown in containers next to entries to create a formal look. Growth rate is regarded as slow, especially when first planted. Growth does improve after 2 – 3 years.